The Korejanai Pentax K-x - designed for Lego men? Maybe I'm a bit miserable or too old, or just not open-minded enough, but I haven't yet managed to appreciate why anyone would buy a DSLR finished in a bright red body shell. Or blue, green or orange for that matter. Why would you do that? What is the attraction? I once was lucky enough to get to see the lunar version of the Minolta Dynax 8000si and remember being really quite taken with its astro-white body and matching lens and flash unit. But I wouldn't have considered owning one other than to show off as a novelty in my camera museum or to take on a trip beyond the ozone layer. It looked rather like a 3fps accessory designed for John Travolta in his Saturday Night Fever days. In the film days we didn't really have SLR cameras in anything other than black or chrome. Cameras looked sensible and functional, and sometimes even cool, without selling themselves on their appearance. When APS film arrived designers excitedly exercised their pencils and went a little wild with shapes and shades. But that was OK for APS – we weren't supposed to take it seriously. It is fun to have coloured compacts too, and Olympus Trip 35s in leopard prints and British Racing Green, but not DSLRs. I'm not sure if it was Pentax that started the trend for chromatic variations in DSLRs but Pentax was certainly the first to take things too far. The Pentax K-x was available in 20 different colours or indeed 100 combinations of body and grip colours. 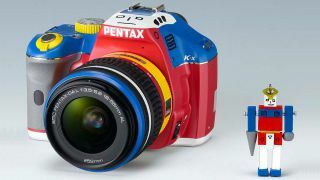 The limited edition Korejanai Pentax K-x and Pentax K-r were multi-coloured monstrosities that looked like a car the scrap man's son had assembled from the wreckage in the yard. Although I admit having a soft spot for the desert camo finish that appealed to my secret desire to document the Afghan war, Pentax used its coloured camera programme to divert us from the fact that the company's innovation had momentarily dried up. When there's a reason to colour a camera (white for space men, sand for desert rats) that's fine, but when a DSLR is coloured to draw attention to it or its owner, someone is missing the point. A camera doesn't have to be just a boring tool - it is fine to love them and give them pet names - but it shouldn't take precedence in conversation over what it creates; the image. Photographers will always chat about kit, and that is fine, but the non-photographic public should notice the picture before the device that made it. Once the camera becomes a fashion accessory you have to start to think about what you are going to wear while using it, and maybe which bag to take. And while I don't recommend doing anything based on a fear of what others will think, just what will people think about this? It would be hard to take a professional news photographer seriously if he was using a bright orange DSLR, because we'd think he'd got his priorities the wrong way around. It would seem inappropriate that he paid so much attention to the way his camera looked, and we'd question his intentions and motivation for doing the job. Using a lime green DSLR is like pairing yellow shoes with a black suit, wearing a comedy tie to a business meeting (or anywhere for that matter) or dressing as Elvis to conduct a wedding. They are all unnecessary embellishments that undermine integrity of function and purpose. Colour on a DSLR is a jollity that is incongruous with the sanctity of the device's mission. It undermines the trust we should have in the person behind the viewfinder as it suggests they don't understand that it is entirely what a camera can do that is important, not its appearance. We are programmed to think such things vain and to believe that vanity, conceit and stupidity are very closely related. The truth is we all consider what a camera looks like before we buy it. Our consideration might only extend to seeing that it looks much as we would expect a camera to, but body design is inevitably important to us all. To test our immunity to aesthetics we might spend a moment determining how we would feel about a 54 million pixel full-frame DSLR with exceptional AF and image quality, priced at £350 and finished with Hello Kitty decorations on teenage-pink body panels. The fact is that cameras should look like sensible tools; cool and well designed, handsome even, but not an end in their own right. They exist to serve, not to be a distraction. Have you ever been to a restaurant where the waiter forgets he isn't a guest and chats so much you can't have a conversation yourself? That's what spotlight-stealing coloured DSLRs do too. And it is simply wrong.